Ford hybrid electric vehicles: to expand its exploration of the positive effects that the use of plug-in hybrid electric vehicles (PHEVs) can have on cities, by commencing commercial vehicle trials in Cologne, Germany. The Transit Custom PHEV has an advanced series hybrid system that targets a zero-emission range exceeding 50 kilometres (31 miles). This makes it ideal for the use in city traffic. As a range extender, it features the multi-award winning 1.0-litre EcoBoost petrol engine that charges the on-board compact liquid-cooled lithium-ion battery pack as required to offer a total range of up to 500 kilometres (310 miles). All partners will use an already existing charging infrastructure and vehicles are equipped with telematics and geofencing systems that help to ensure that they are emission-free within pre-determined low emission zones. Ford is the No. 1 selling commercial vehicle brand in Europe, and last month Ford commercial vehicle sales in its European 20 markets hit their highest October level since 1993. 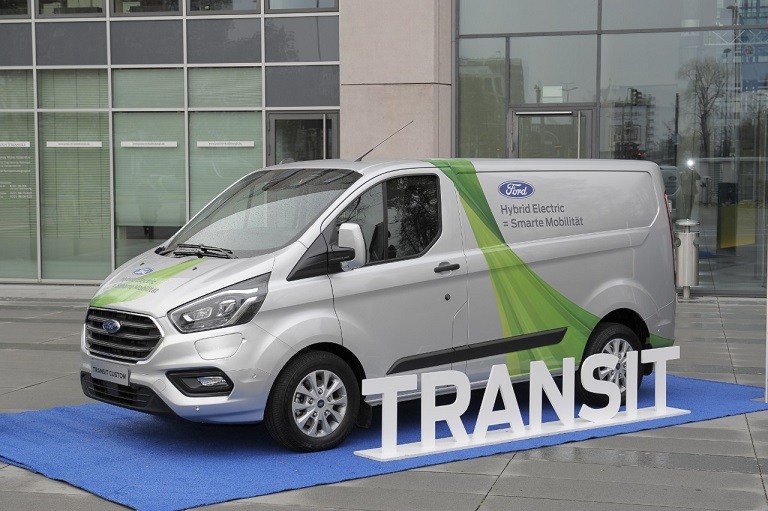 At the IAA Commercial Vehicles in Hannover, in Germany, in September, Ford showcased a production version of the Transit Custom PHEV that is due to go on sale in the second half of 2019. Ford plans the introduction of another 40 electrified models, including 16 all-electric vehicles through 2022. Ford of Europe is responsible for producing, selling and servicing Ford brand vehicles in 50 individual markets and employs approximately 53,000 employees at its wholly owned facilities and approximately 68,000 people when joint ventures and unconsolidated businesses are included. In addition to Ford Motor Credit Company, Ford Europe operations include Ford Customer Service Division and 24 manufacturing facilities (16 wholly owned or consolidated joint venture facilities and eight unconsolidated joint venture facilities). The first Ford cars were shipped to Europe in 1903 – the same year Ford Motor Company was founded. European production started in 1911. Ford employs approximately 200,000 people worldwide. Elettrificazione e hybrid Ford. Anche a Colonia, i Transit Custom Plug-In Hybrid.